"Susan Sindall's poems are surprising and lilting, and deeply moving; these poems give thanks even to her glasses: 'lens edges/ throw back into me/ whatever light they can.' But this poet does not deny the experience of suffering. She does not cease to question. What's Left is a complex and wonderful book." 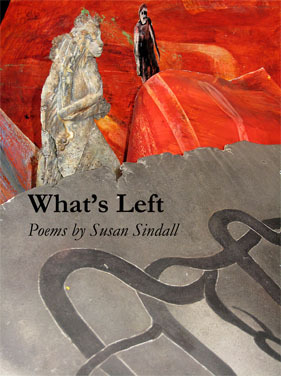 The poems of Susan Sindall's What's Left search for what endures, standing slightly apart from the world, from experience, from memory, to see with precision sharp as ice. To join the mailing list or to contact Susan, click here.